I rarely print out my documents on Google Docs. Most of the time I'm sharing a document with others for purely online consumption. But there are occasions when I need to print, like I had to do today to turn in a hard copy of my homework for the computer science class I'm taking this quarter. (The paperless class remains an urban legend!) When you have to print, it's super helpful to see a quick preview to make sure everything looks as expected. 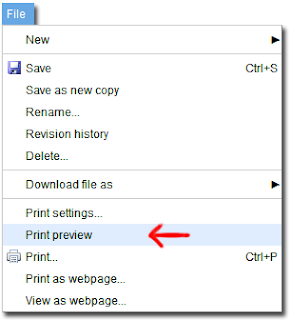 Starting today, you can do this by using the "Print Preview" feature in the "File" menu. Those of you who have uploaded PDFs to Google Docs or have viewed PDFs in Gmail may notice that the new "Print Preview" feature is powered by the same fast and high fidelity PDF viewer. You can then preview the pages of your document, edit your print settings (if needed), and print. In other news, we've just enabled offline access in 9 more languages: Bahasa Indonesia, Chinese (simplified), Chinese (traditional), Japanese, Korean, Portuguese (Brazil), Portuguese (Portugal), Thai, and Vietnamese. Why the brief delay? We wanted to do some final testing on those languages before making them available to everyone. 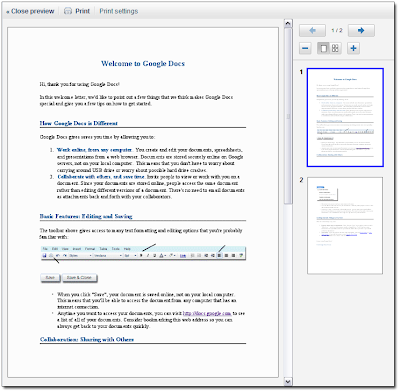 To get your Google Docs offline, I highly recommend that you start by reading this user group post.